Based on the play by Seika Mayama, The 47 Ronin is a two-part film about a samurai faction who go on a quest for vengeance for their slain master during the 18th Century. Directed by Kenji Mizoguchi and screenplay by Kenichiro Hara and Yoshikata Yoda, the film is an exploration of honor and devotion where 47 men cope with the loss of their leader and the need to avenge his death. Starring Daisuke Kato, Chojuro Kawarasaki, Kanemon Nakamura, Isamu Kosugi, Masao Shimizu, Utaemon Ichikawa, and Kunitaro Kawarasaki. The 47 Ronin is an engaging yet flawed film from Kenji Mizoguchi. The film revolves a samurai clan who decided to go rogue after their master is forced to kill himself following an assassination attempt against another clan lord. It is based on a real-life incident where a group of men decide to avenge their master against the man he tried to kill as well as those who supported that lord. Told in two parts, the film follows the incident in which Asano Naganori (Yoshizaburo Arashi) tried to assassinate Lord Kira (Mantoyo Mimasu) over a grudge as Asano would receive punishment but Kira would receive no punishment. For the people working for Asano, they see this as unfair as Asano is forced to commit hara-kiri with his land and homes confiscated by other lords. The film’s script is divided in two parts with the first half focusing on the assassination and the planning to avenge Asano led by his retainer Oishi Kuranosuke (Chojuro Kawarasaki) while the second part is about an attempt on Lord Kira and the actual attack on Lord Kira and its aftermath. All of which takes place in a year yet it emphasizes more on drama rather than action. Kejji Mizoguchi’s direction is entrancing at times as much of the film consists of some long takes where it has this theatrical tone to the drama. Much of the film features scenes with a lot of dialogue as well as scenes that feature no dialogue at all as some of these moments would drag the film immensely. The lack of action with the exception of a lone scene where one of Asano’s men tries to kill someone in a costume for a performance for Lord Kira is the only moment where there is any kind of action. 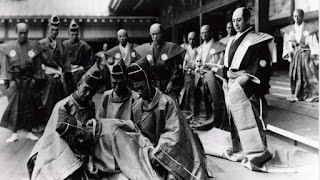 Much of it is all about setting up the revenge but also discussions from all sorts from the men who served under Asano to even the women who were part of the house or wives of some of Asano’s men. Many of these scenes go for on for a long time as there’s moments where the scenes tend to overwhelm itself and be overdrawn including its ending. The sluggish is what hinders the film as Mizoguchi could’ve trimmed things down despite some of the beautiful compositions and camera movements he creates in the film. Overall, Mizoguchi creates a compelling but sluggish film about a group of men trying to avenge their master’s death. Cinematographer Kohei Sugiyama does brilliant work with the film’s black-and-white photography to the natural look of the exteriors as well as some unique lighting and shades for some of the interior scenes. Editor Takako Kuji does some fine work with the editing as it is straightforward despite some of the film’s very long scenes. Production designer Hiroshi Mizutani, with set decorators Dai Arakama, Atsuo Matsuoka, and Hisako Oozawa, does amazing work with the set design from the interiors of some of the homes of the clan lords as well as some of the exteriors of the castles and homes. Costume designers Ryuzo Kawada and Yoshisaburo Okumara do excellent work with the design of the robes that the men and women wear including the costumes for the Noh theater scene. Sound mixer Seiichi Harada does terrific work with the sound to play into the quiet and calm atmosphere of some of the drama including the opening sequence where Asano tries to kill Lord Kira. The film’s music by Shiro Fukai is wonderful as it’s mainly a low-key orchestral score that play into the drama. The film’s marvelous cast include some notable small roles and appearances from Mantoyo Mimasu as Lord Kira, Meiko Takamine as the fiancée of one of the ronin warriors, Mitsuko Miura as Lord Asano’s wife, Yoshizaburo Arashi as Lord Asano, Masao Shimizu as a member of Lord Asano’s clan, Daisuke Kato as a lieutenant of Asano, Kunitaro Kawarazaki as a young ronin warrior, and Kanemon Nakamura as a senior advisor of the Asano clan. Finally, there’s Chojuro Kawarazaki in a brilliant performance as Lord Asano’s retainer Oishi Kuranosuke as the man leading the plan for revenge as he is meticulously trying to see how can make sure nothing can go wrong. The 47 Ronin is a stellar but immensely flawed film from Kenji Mizoguchi. It’s a film that explores a legendary story of revenge though it is hampered by its sluggish pacing where for a two-part film running at nearly four hours. It is a film that isn’t very easy to watch. In the end, The 47 Ronin is a good but challenging film.